Nissan Motor Co. vehicles awaiting shipment stand parked atop a building at the company’s facility in Yokohama City, Kanagawa prefecture, Japan, on 2 November, 2011. Bloomberg. Yokohama: Nissan Motor Co posted better-than-expected quarterly profits and lifted its annual earnings and sales forecasts on Wednesday, shaking off worries about the Thai floods and the global economy. The move by Japan’s No.2 automaker stands in stark contrast to the results at rival Honda Motor Co , which withdrew its earnings guidance this week with no imminent recovery in sight for its flooded car factory in Thailand. Nissan said it would try to restart work at least partially from 14 November by procuring substitute parts through its global supply network, likely limiting output losses to 40,000 vehicles in Thailand and any disruption in Japan to 20,000 vehicles. “The latest results provide some evidence that Nissan is coming through the Thai flood crisis better than its rivals," said Hiroyuki Fukunaga, CEO of Investrust in Tokyo, which does not own Nissan shares. Nissan’s chief operating officer, Toshiyuki Shiga sounded an optimistic note, saying the company was poised to continue outperforming its rivals. “As we look forward to the second half, we remain confident in Nissan’s ability to deliver improved retail volumes and solid revenues despite challenging market conditions," he told a news conference. With a maximum impact of just 60,000 vehicles from the Thai floods, Nissan raised its global sales forecast for the year to March 2012 to a record 4.75 million vehicles from 4.60 million. Nissan said it had plans in place to prevent any impact from Thailand’s floods on production in North America, Europe, and China, thanks to a more robust supply chain strengthened after the 11 March earthquake and tsunami in Japan. The automaker had also hired divers to search its suppliers’ flooded factories to salvage machines and molds that could be dried and used, executive vice president Andy Palmer said. Nissan, held 43% by Renault SA , lifted its annual operating profit forecast to ¥510 billion ($6.51 billion) from ¥460 billion , bringing it near the consensus ¥ 520 billion in a survey of 25 analysts by Thomson Reuters I/B/E/S. It now expects a net profit of ¥290 billion . “I think the revision is positive, but not necessarily a surprise," said Tsuyoshi Mochimaru, an auto analyst at Mitsubishi UFJ Morgan Stanley, adding that the initial forecasts were excessively conservative. “The strong yen remains a worry for the second half and the European market is something to watch." 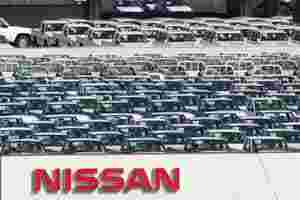 For the July-September second quarter, Nissan said operating profit fell 4.6% to ¥159.3 billion , above an average estimate of ¥133 billion in a Reuters survey of 13 analysts. Second-quarter net profit was ¥98.4 billion , down 3.3%, while revenue rose 0.7% to ¥2.29 trillion as the maker of the March subcompact boosted its share in most big markets. Like other Japanese automakers, Nissan is grappling with a dollar that has weakened to record lows recently and remains below ¥80, even after Japan’s yen-selling intervention. Shiga said Nissan was assuming a dollar rate of ¥80 for the second half, versus around ¥78 on Wednesday, partly in the hope that the Bank of Japan’s intervention would have a lasting impact. Earlier, Mazda Motor Corp slashed its operating profit forecast to break-even from ¥20 billion, citing prolonged yen strength. It now expects a net loss of ¥19 billion instead of a 1 billion yen profit forecast earlier. Shiga said Nissan was taking aggressive steps to offset the yen’s damage, such as by using its global parts network to buy more parts from China and elsewhere to lower the cost of building cars in Japan. Nissan is also pushing rapidly into emerging markets, including through a partnership with Ashok Leyland Ltd in India and a recently announced factory in Brazil, he said. In a bid also to take its premium Infiniti line global, Nissan said on Wednesday it would locate the brand’s global headquarters in Hong Kong, targeting wealthy consumers in China and elsewhere. CEO Carlos Ghosn has said Nissan would likely build Infiniti cars in China eventually because much of the growth in demand would be in that market. So far this year, Nissan’s sales are up by double-digit percentages in every major region except Japan. With Honda unable to meet demand, Nissan outsold its rival in the profitable US market during the quarter, although it fell below Honda in October. Demand in debt-burdened European countries such as Spain and Italy had weakened, but Palmer said surging sales in Russia was plugging that hole. “The only problem we have today, frankly speaking, is we can’t make enough Qashqais and Jukes, that’s it," he said, referring to the popular compact SUVs produced in Britain. Nissan’s shares have fared much better than its rivals so far this year, falling 6.7% against losses of 19% and 25% for Toyota Motor Corp and Honda, respectively. Before the results were announced on Wednesday, Nissan shares ended down 2.8 %. Mazda lost 5.4%. Toyota will report financial results on 8 November.